Idag är jag tillbaka i Stockholm för att gå på några events, träffa vänner och familj, men huvudorsaken är Fashion Week Stockholm som börjar på söndag vilket är en smått udda dag att börja på enligt mig… För att se vad som sker under veckan kan ni följa mina Instastories och inom kort kommer det att komma ett inlägg om vad Stockholm har att erbjuda inför AW17. De stora märkena som Filippa K och ACNE har sedan länge (med vissa undantag) inte längre visat på modeveckan i Stockholm, vilket är synd. Annat var det förr när jag var på det då helt ohajpade Telefonplan och såg Mini Andén gå Filippas visning i någon sliten industrilokal. Att ha äran att gå på modeveckan i Stockholm är en milstolpe för mig ur många perspektiv. 10 år sedan när jag jobbade som bland annat modeskribent och senare med PR brukade dessa front row-platser på dessa visningar vara vardagsmat. Skälen till varför det är en enorm personlig delseger kan du läsa om i mitt inlägg här och även om jag varit på modeveckor i både Paris och London efter att jag blev nykter och ska göra The Big Four (London, Milano, Paris & New York) i sommar, så är det modeveckan i Stockholm som är viktigast för mig på ett personligt plan. 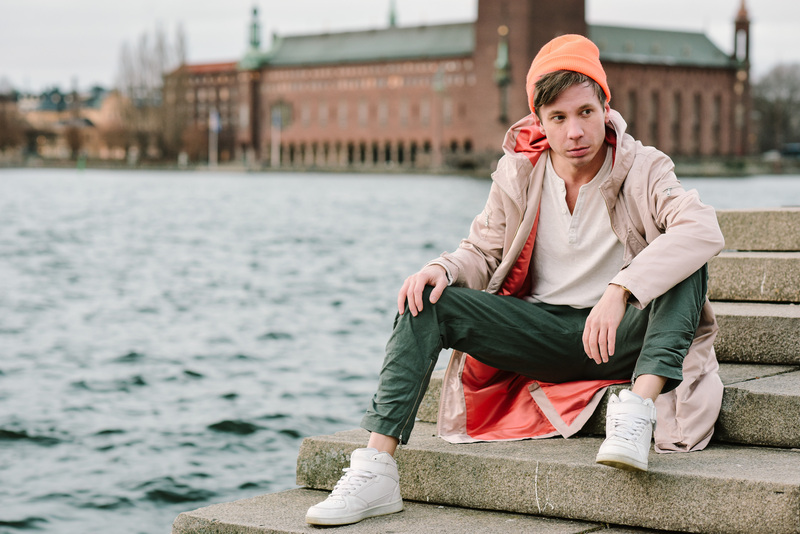 Självfallet kommer jag att bära så mycket svenskt mode som möjligt under modeveckan och den här outfiten från KHND Studios med färgskalor jag snappade upp på modeveckan i London (pasteller, grönt, orange) är en av dem. Jag är stolt över att få bära deras plagg då de inte är lika kända i Sverige som utomlands och i Sverige tycks vi ju ha en något konstig inställning till att man måste slå igenom stort utomlands först för att kunna slå igenom i Sverige. Detta är något som tycks gälla både KHND och mig. Det känns som att vi båda återvänder till våra rötter. I neee to travel more during Fashion Weeks! I am missing out on all the good stuff! You looked great! Such a lovely post man!! 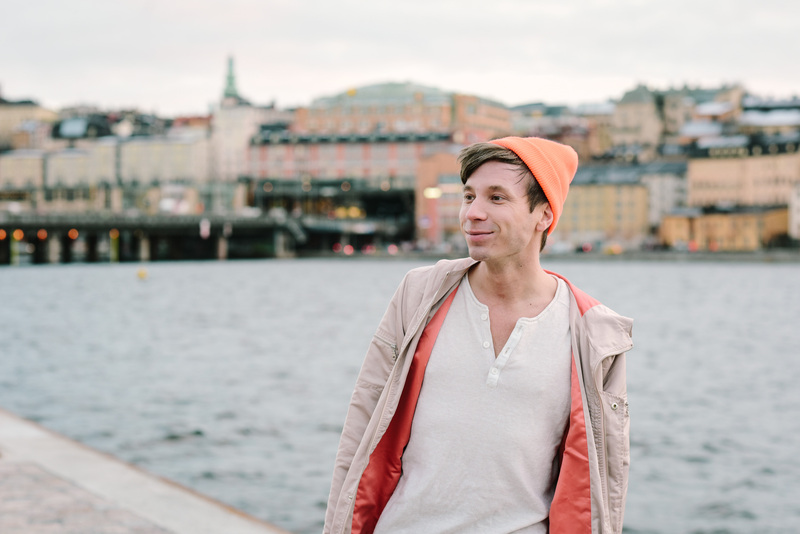 In love with the bits of Stockholm on the background! I hope you’ll have lots of fun at Stockholm Fashionweek. Don’t be nervous, just be your fabulous self and rock it. Can’t wait to see your actual FW-outfits and hear all about it. I’m super in love with that jacket and i love this color palette! You’re going to have a great time at the shows and I’m looking forward to catching your stories! I love this look on you! The neutral palette with the pop of orange looks so rad together. Hope you have an awesome time at Stockholm Fashion Week! I love your style! Can you please come teach my dad and brother how to dress?! I can’t wait to see what Stockholm FW was like, it’s such a gorgeous city! It’s cool to hear how you’re coming back full circle this year, now being on the other side of blogging, over PR. I’m sure it’ll be loads of fun! 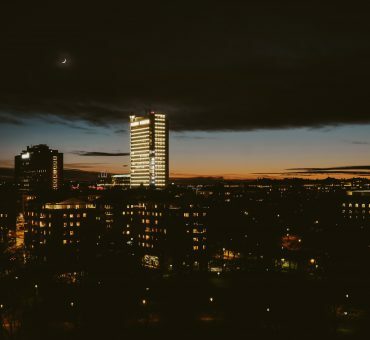 I really love this post as you showed us parts of Stockholm through your pictures. What can I say, Stockholm has won my heart. I am so happy you are back to this gorgeous city – your happy place. Green, pastels and orange are perfect combo even though I wish I could look as good as you in orange. You truly have the best men’s style. Can’t wait to see more of Stockholm Fashion Week through your Instastories, my love. I love that you have so much Swedish pride and support Sweden brands! I also think the colors of the outfit go perfectly together and definitely make you stand out since so many people stick with neutrals. Love this look – the orange and green are so good together! And I want to see more smiling pics of you! I always brood a lot in photos thou LOL. I love that you are going back home with a sense of accomplishment. So amazing that you got to experience fashion week first hand! As for your outfit, I love the peach tones, they compliment you very well. My favorite is that jacket ? I really hope you enjoy your time in Stockholm! It looks like such a beautiful place, and it’s really neat that you can look at your visit as an accomplishment in a special sort of way! You’ve achieved so much over the past few years, hon! I really am proud of you! I also totally love these photos! The colors blend perfectly together! I have to tell you, although I think you know , that I simply can not get enough of your instastories and the blog posts in your archives. The way you’ve grown both professionally and personally is both inspiring and extremely commendable. I adore the styling of your ACME clothes , especially the beautiful colors here. So flawless and flattering , although I’ve never seen you in anything that wasn’t tremendously appealing. I’m looking forward to seeing and hearing all about Stockholm and also I want to thank you for giving me someone to look up to. You are extraordinary. Fashion Week is really good chance to travel! I will definetely check your Instastories! Adore your photos – looks so professional, good work! What a homecoming for you Thomas! If I have said it once, I’ll say it again, I love how much you champion homegrown talent and bring them to a international platform! I have to get out there someday, that backdrop is as gorgeous as your outfit! I hope you have an amazing time at fashion week! I can’t believe you get to travel to all of those, that’s so much fun 🙂 Congrats on all of your accomplishments! You’re so cute dear, that look with the beanie. I love that you are supporting local brands, they definitely appreciate it too. I have couple designer friends and when I wore their pieces for NYFW, SFW they loved to see my street style photos. I think it is awesome that you keep going in your Fashion adventure even you had some hard stories in your life. I bet it is a huge achievement coming back to this event! Love the look with the pops of orange. And Stockholm behind you looks absolutely gorgeous. It’s always nice to represent your country’s brands because it’s a chance to show your pride. Enjoy Stockholm Fashion Week! It’s so nice to see Stockholm in the background! I think it’s amazing that you’re supporting Swedish brands for Fashion Week. It’s seriously a dream to attend any Fashion Week, but I have high hopes for Paris one day! You’ve come so far and all the best to you! This style I have to say, I am a big fan. You are looking so good buddy. I will Definitely have to visit Stockholm one day. This is amazing achievement to be able to be part of local brands and backstage. I really can explain how I ma looking forward for you to be in NYC for NYFW so we catch up finally. Seriously one of my favorite outfits! That orange hat and those green pants are amazing!!! YESS!!! Please shoot and share more around the city! I love being able to see other cities in this context. Swedish designers are always my favourite, I suppose somehow channeling a distant heritage in me. Of course, I love to wear Acne and a few other well known brands, so it is always exciting to see the lesser known brands during fashion week. Looking forward to your coverage!! First off, I love your outfit. the bright colored beanie is just awesome! I didn’t know ACNE studios was from Sweden. Such a shame that all those big names don’t show in Sweden, but I know most of the designers who make it big in Toronto, like Mackage, end up showing at one of the IMG ones. I haven’t been to fashion week for a few seasons now, but also used to work in fashion in branding and sponsorship. Funny enough, I forgot I had an invite to a party for Mens Fashion Week in Paris and missed it while I was there on vacation. I haven’t booked a flight for NYFW yet, but seeing how I’m back in the field as a personal style and travel blogger, I think I will probably attend the shows I’ve RSVPd to. I hope you have an amazing time and can’t wait to see the outfits and hear about you experience this season. I have always been a fan of Acne studios and didn’t knew they were from Stockholm so thanks for sharing that. Really love the city background in your pics. I am actually not a big fan of orange as a color but the whole combination is so on point! Wow Tommy! You are rocking this outfit! I love how the colors look on you! I’m happy your home for fashion week and that you get some time to catch up with friends and loved ones. Looking forward to seeing what other amazing outfits you will rock in the month to come! Hope you are well. I love this styling so much, and the colors! You look so awesome as always and the pictures are so beautiful and impressive. Just by looking at your pictures, I feel in love with Stockholm and hope to visit one day. Hope you had a wonderful weekend, Thomas! Oh, I love seeing the city in the background! It and the water are lovely! And I love the colors you’re wearing!! Also, congrats again on your amazing achievements, especially personally with overcoming so much and achieving sobriety!! Celebrate every little victory and all the milestones!! I hope you do come to NYFW!!! I love near NYC and would love to meet in person! You look so colorful!! I am loving it and oh that pants is so great on you. Green is my favorite babe? That orange and green look so great together. I especially LOVE that photo of you smiling!!! I love how you always support your Swedish brands. It shows your support and love for your country and who you are as an individual as well. Stockholm looks so beautiful and I would love to visit one day!! Right now I will just enjoy the photos through you Thomas! Such a stunning place! I need to pay a visit there! It’s great that you support Sweden’s brands and local industries. It’s not hard to see why with this outfit that you’re sporting Thomas. 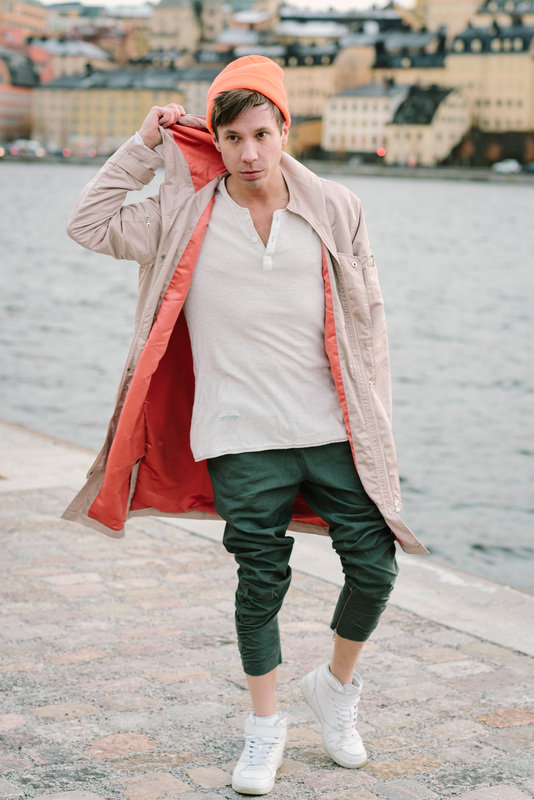 I hope you had a fantastic time at Fashion Week Stockholm! As always, thanks so much for sharing! Yay! I adore the pants you wearing and just the color combo in general! I hope you have such a great time at fashion week there! It’s so awesome you’re attending! I’m jealous that you can easily do the big four. Have so much fun at fashion week. Love your outfit here, green is the color of the year, and I love the green and orange together. I’m sad we are not seeing ACNE studios there this time, I’m a fan of theirs. Such a gorgeous shoot and love the city backdrop! Also – hope you have an amazing time at FW if you end up going to shows and events! 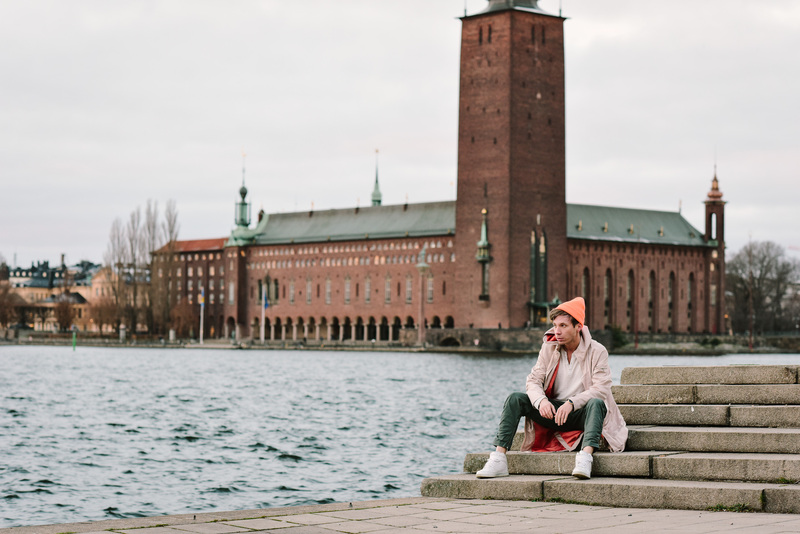 I love that you featured Stockholm in this post. It looks absolutely amazing! Love the subtle hints of color in your outfit. Can’t wait to follow along in your IG stories! 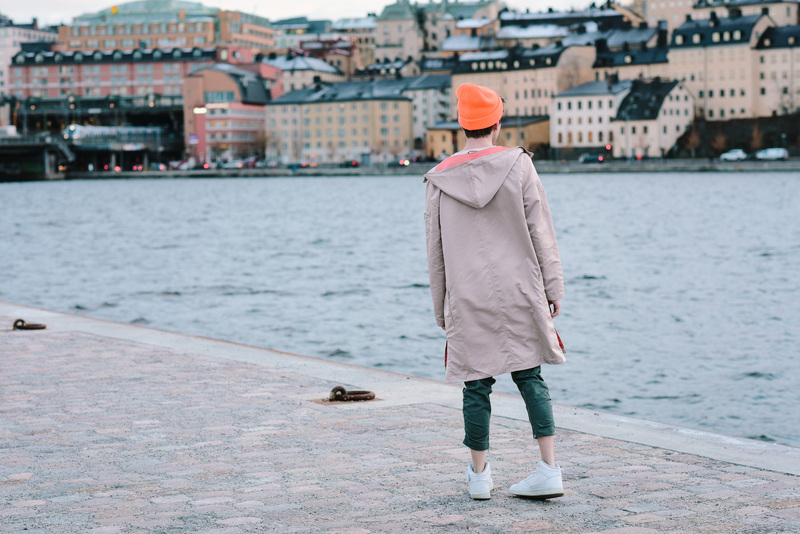 I’ve always wanted to visit Stockholm because it just seems like such a stylish place. 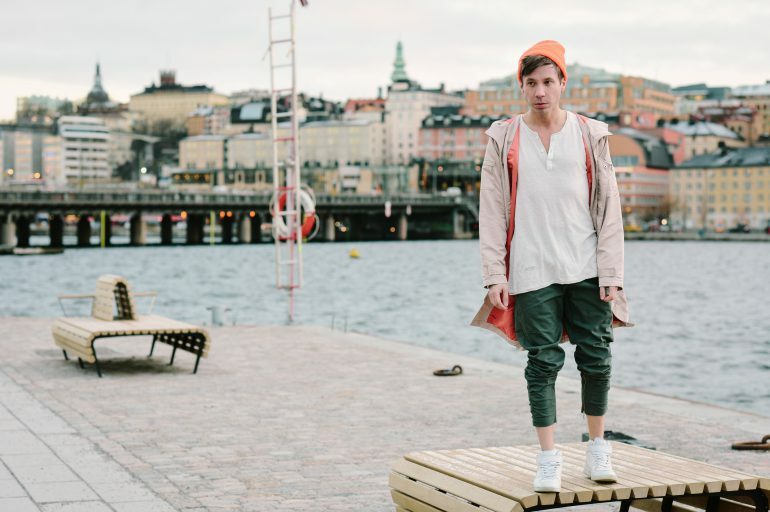 In fact, the my favorite fashion blog back in the day (before fashion bloggers were even a thing) was Stockholm Street Style! I would regularly comb that site for inspiration. I love that you’ve finally shown us a bit more of the actual city you live in. Also loving those jogger pants you’ve got on! Enjoy your Stockholm fashion week. love this look on you! Cant wait to see your reports from fw! I love this look Thomas and think the 3 colours blend really well together! I love Sweden design! Is there anything you guys do wrong?! Nope , don’t think so! I love the pictures you have taken because of the scenery behind. Stockholm is such a beautiful city! I hope I can visit done day! I had no idea that Stockholm was built on islands- that’s really interesting! It certainly does make a very beautiful background to all your photos and I adore how your hat compliments the lining of your coat. Swedish fashion week sounds amazing- I think that Swedes have the best aesthetics 🙂 Have the best time and looking forward to reading about it! Stockholm is definitely a place on my bucket list of places to travel to! I’m sure it’s a beautiful place to explore. Hope you have fun at the upcoming events and then fashion week. I agree that it’s super odd that it starts on a Sunday lol! But I’m sure it’ll be wonderful nonetheless. I love this pop of orange! Super cool that you got to wear something from KNHD! I think this is the perfect shade of orange, vibrant but not totally loud. It really compliments you well too! Can’t wait to hear more about your experience this upcoming weeks. This outfit is definitely one of my favorites. I really like the pop of orange. Hope you are enjoying fashion week. I love this look Thomas! These pics are so pretty! I’ve always wanted to visit Sweden! Enjoy yourself! So much fun to get to go to FW! I love your pants Thomas! Love how you match it with a stylish hoodie! Love this whole combo! Setting the trend for sure! Love that you were on location for this shoot! And killing it in this fun orange! Hope fashion week is a blast, as I’m sure it will be! Have fun at fashion week! Such a beautiful accomplishment! Many congratulations to you! You defied the odds and ended up on top! I love this outfit you are wearing! The orange beanie is the icing on the cake! That’s such a cute outfit for the shows! I bet you get photographed by street photographers all the time! I would totally place this look into the ”best looks of the fashion week” section! So glad you are in Stockholm to visit Fashion Week Stockholm!!! Can’t wait for that recap of what Stockholm has to offer 🙂 Seriously loving every single photo of yours!!! Stockholm looks gorgeous, it is a city I would love to visit one day. I am sure you are enjoying being back home, especially for Fashion Week. I will be keeping an eye out for your Instagram Stories too. I love what you’re wearing for this shoot, your outfit looks so well put together. You have totally inspired me to try pairing Orange and Green together. I am eagerly waiting for your Fashion Week posts. So excited what new content you’ll have up this year! You’re always in the know! I would love to visit Stockholm! Maybe I should come to fashion week – Sweden has so much to offer when it comes to fashion and interior design! I think the brands that you’ve mentioned like H&M and ACNE Studios doesn’t need to do this kind of shows anymore as they probably think no matter what they’ll do they’ll make money and just save the money putting towards a show to do big commercial production they show on social media and in store. I cant wait to hear more of your stories for the other fashion weeks. have a great one Thomas! I’ve never been in Stockholm, but after your posts it’s my dream destination! I’ll probably go there in the spring! My little brother actually had his birthday party at the city hall hehe. Loving this look. This look is so cool! I really love how you matched those two bold colours! Love it ! Sunday really is an odd day to start fashion week. Did you have an amazing time? I love the orange!